Six millionaires and seven half-millionaires were created this year at Sibaya Casino, all thanks to the Golden Ticket promotion. Basirath Rajaram from Phoenix in KwaZulu-Natal is the latest instant winner of one million rand. Read on. Basirath Rajaram is the latest millionaire at Sibaya Casino’s Golden Ticket promotion. 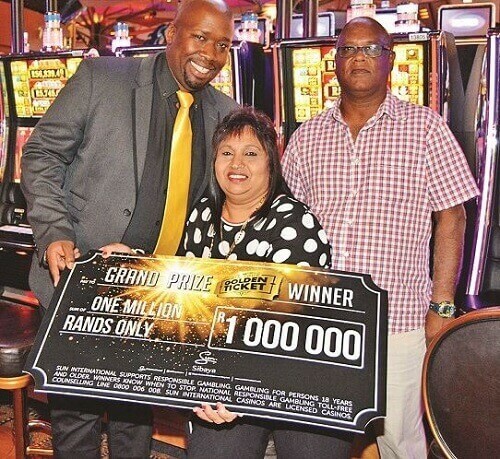 After spending thousands of rands playing at the South African casino for a couple of years, the 57-year-old could not believe it when her ticket was drawn from a box of 250 hopeful entrants last Friday. She tells IOL: “I was walking out of the room where the draw was being held when my name was called after Aunty Rumba (Durban comedienne Jailoshini Naidoo) drew my ticket. I just stood there, shocked, while my husband told me, ‘go go, you won’,” said Rajaram. That night “I couldn’t eat or sleep. I just sat on the bed the whole night, smiling. It was a happy kind of shock” she added. Rajaram won the Golden Ticket in August this year and was automatically entered into the lucky draw. “I never thought I would see seven numbers in my account. Before we won, my husband joked that he’d phone our daughter and say we won the jackpot. Now it’s true. I thank God,” she enthused. The gaming manager at the casino, Robbin Kennedy, said the promotion has once again proven to be one of the most exciting competitions in the province this year. He says: “We congratulate our Golden Ticket winner and latest millionaire, Basirath Rajaram. Certainly, nothing pleases us more than to see our guests winning big especially at this time of year. We would also like to thank all of our wonderful guests who participated in the promotion and made it so successful,” he said. Rajaram is the latest to win the competition after Deresh Ranjith won a convertible Jaguar F-type in June this year.